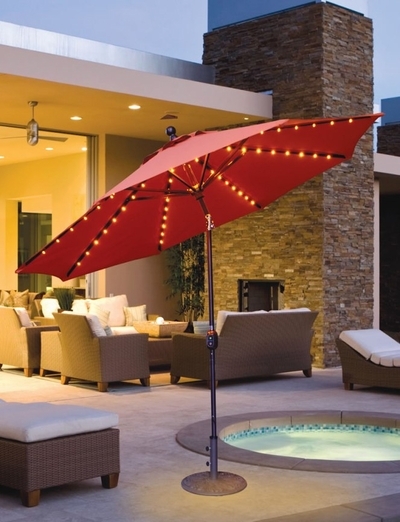 Make your outdoor gatherings a bit more festive with the Galtech 9' Auto Tilt Outdoor Umbrella with LED lights. Brighten up the night with the built in LED lighting system that gives off a soft and pleasant illumination. With the click of a switch you can operate the lights and with its long 20 ft. cord you can reach any grounded outlet with ease. The lights are tested and will provide up to 15,000 hours of use. Built to last, this outdoor umbrella has a powder coated aluminum pole that is sure to endure through the harshest weather elements without the worry of rust or corrosion. With the wide variety of premium Sunbrella and Suncrylic fabrics, matching your patio umbrella to your outdoor decor is a breeze. This season, sit back and relax, day or night, with this charming outdoor umbrella that will add upscale appeal to your open-air space.